28th: Prep Ahead Picnic – If you’re going for a picnic or a roadtrip, what do you pack? What do you make? A few years ago for MoFo, I wrote about what I'd pack for a road trip, and that pretty much still stands. I remain a hoarder of all things snack related! So I thought I would do a little picnic post today. 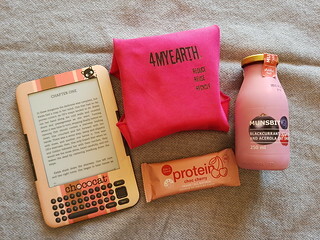 I like pink, so I decided to a few pretty pink snacks and sandwich would make a nice little picnic lunch, along with my cute pink Kindle to read. 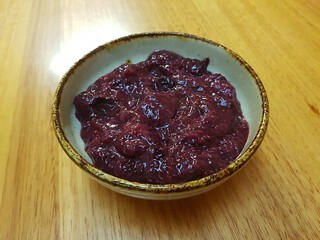 Berry Rhubarb Chia Jam from Vegan Yack Attack On The Go by Jackie Sobon: First up, I made some jam to go in my sandwich! This jam was super easy. Just simmer blueberries, strawberries, and rhubarb with some water and maple syrup, then add chia seeds and let cool and thicken in the fridge. I used slightly more rhubarb and not quite as many blueberries, just due to the weights of the fruit that I had. It is a really nice jam. If only has 1 TBS of maple syrup in it as a sweetener, so it is quite tart. I really liked that, I do not like very sweet jam. It had a lovely texture, and kept well in the fridge for several days. Grown-Up AB&J from Vegan Yack Attack On The Go by Jackie Sobon: I used the jam to make this sandwich, which got wrapped up in my little sandwich wrap. 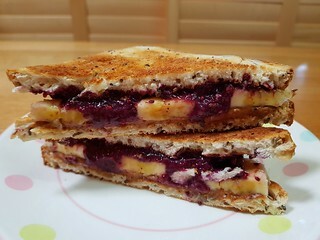 It is toasted bread with almond butter, sliced banana, jam, a drizzle of agave, and some cinnamon and cardamom. It definitely is the grown up version of the PB&J, being much less sweet. But it is a really nice combination, and is quite filling as well. And what of the other parts of my picnic? 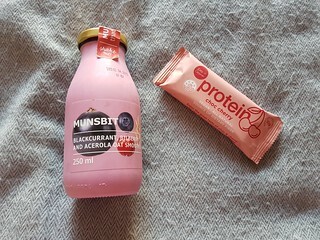 A cute pink drink and a lovely pink bar to go with it. The drink is a little Oat Smoothie that I picked up from Ikea, with blackberry, bilberry, and acerola. It was quite tart, which was nice. The bar is from Keep It Cleaner. While I loathe the use of 'clean' in relation to any sort of food (unless you've dropped it in the dirt, no food is dirty), these bars Choc Cherry are actually delicious. They do have to live in the fridge, so not something to keep in your bag. But I always have a couple in my fridge now for a small snack. This is an old photo from a non-digital camera that I have scanned, from back in my Sydney days (same as yesterday). 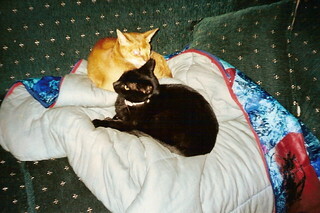 It got cold in Sydney, and this particular house was big and hard to heat, so in winter I kept a sleeping bag on the sofa for snuggling. Of course, it was hot cat property. You can see how Sahara has snuck in and curled up tight behind Dim Sim... and how miffed Dim Sim is. I first saw that Ikea had those smoothies on a UK friend's post, so hopefully they are in the US as well! They also make an apple one, in a cute pale green bottle. That's quite a sandwich! I like putting sliced strawberries in mine sometimes. So decadent, somehow. Ooohhh... yes. Fresh fruit is such a nice addition. That sandwich sounds perfect!! I guess I never think of fancying up PB&J! I seriously love all the pictures of poor Dim Sim being forced into a snuggle! My Joan can certainly relate! It was always surprising when she stayed out. Normally she would hiss, maybe give a little swipe, and sulk off. The jam sounds fantastic, and the sandwich looks great! Love the pink picnic theme! Thanks. Pink is my favourite colour, so I loved putting this together. What a cute-looking picnic! :) That sandwich looks perfect. And the smoothie sounds delicious -- I haven't seen them at my IKEA yet. I've been meaning to go there to try their new vegan hot dog too. We don't have the vegan hot dog or the vegan soft serve here yet. Just the balls. But there are some fun vegan finds in their grocery section. VeganMoFo 2018 #1: Hello, it's me!